One of the most important reasons for the Holy Land trip is to symbolically mark the end of the acrimony between the two religions. 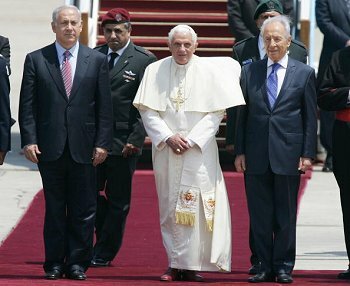 By itself, the itinerary of the papal visit gives a new definition of the Holy land — one that not only includes just Israel but Jordan, Syria and Lebanon as well. This expanded view represents a vital dialogue about civilization and shared faith, as well as a sense of community between Christianity and Islam in the Middle East. For the past 1,200 years Islam and Christianity have shared the Mediterranean region in a mostly beneficial relationship, which included the Islamic preservation of Greek philosophy that sowed the seeds for the Renaissance in Europe. Trade along the Silk Road from China and India to Europe was overseen for 600 years by followers of Islam. The period of peace and cooperation between the two religions thus far exceeds the period of discord. During his trip, the Pope will try to stress exactly this — Islam and Christianity have a far longer history of cooperation along the Mediterranean shores then of confrontation. Not only does history connote this direction, current geopolitical realities are trending the same way. Today, followers of the two religions share energy reserves, and the energy markets of Europe and the Middle East are both involved in controlling the strategically vital region which includes the Mediterranean Sea and the Middle East. In addition, Europe is playing host to a community of more than 40 million Muslims who must adapt to their presence in a predominantly Christian society. In the Middle East, a strong and historically viable community of more the 18 million Christians exists in majority Muslim countries. So, the reality is that adherents of the two religions are fated to work together for the sustenance of the growing Islamic community in Europe, and for Christians living in the Middle East. At a speech in the Al Hussein Mosque in Amman, Jordan, Pope Benedict stressed the long connection between Islam and Christianity and the fact that Islam is the only religion that recommends that its followers form friendly relations with Christians. The Quran also has a sura dedicated to Holy Virgin Mary and to Jesus (The Family of Imran). Jesus and John the Baptist are regarded as prophets and models for the Islamic community. In Hadith (words and actions of Prophet Mohammed), Jesus marked the coming of the end of days, and Prophet Mohammed confessed that Jesus is among the prophets closest to him. All of this Quranic and Islamic testimony fails to conjure up an image of any confrontation between Islam and Christianity. In a similar vein, the Pope declared during his trip that Christians should have a profound respect for Islam. Pope Benedict's new message is making a lot of individuals and groups that took advantage of the confrontational stance between the two religions unhappy. Radical Islamic organization tried to play on the fear of Christian offensives like the Crusades. They wanted to poison the atmosphere of the papal visit, spreading rumors about Christian missions in Afghanistan trying to convert Muslims. But the radicals have had no success in disseminating such lies and the Afghanistan controversy did not match the cartoon controversy of several years ago. In Israel, also fearing closer ties between Christianity and Islam, far right extremists plan to protest violently and disrupt the Pope's visit. Until now, attempts have failed to prove that on both shores of Mediterranean Sea the vision of a clash of civilization has collapsed and that a new dialog between Christianity and Islam can resolve many of the bitter conflicts in the region, thus promising the downfall of radicals in the Middle East. The time of cooperation has begun.